How can we engage more artists and kids in creating art for social awareness and change? Q&A with Micah Bazant about creating art with and for the trans community. Micah Bazant is a trans visual artist who works with social justice movements to reimagine the world. They create art inspired by struggles to decolonize ourselves from white supremacy, patriarchy, ableism, and the gender binary. Micah is an anti-zionist jew and identifies as trans, nonbinary, and timtum (one of six traditional jewish gender categories). They make art as a practice of love and solidarity with trans justice and racial justice movements to help build power and shift cultural narratives. The ongoing process of developing ethical models for collaboration with grassroots community organizations is a large part of their work. 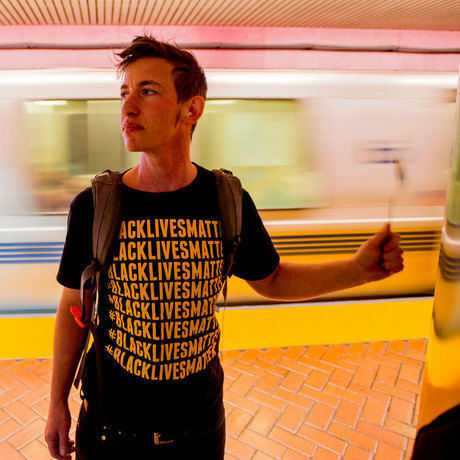 Micah has worked with hundreds of social justice groups across the US, and their work has been shared millions of times on social media and in the streets, as well as in galleries, museums and publications. They co-founded the Trans Life + Liberation Art Series and the Trans Day of Resilience art project, to help support and celebrate trans people of color while they are alive. In March 2017, Micah joined the staff of the national organization Forward Together as Artist in Residence. They are also an advisory board member of Sins Invalid, and a member of the Jewish Voice for Peace Artist Council. They live in the Bay Area and enjoy learning the secret histories of plants, fostering monarch babies, and admiring sparkly things.